PITTSBURGH (AP) On the surface, the situation Kevin Stallings walked into when he took over at Pittsburgh in the spring of 2016 looked promising. The Panthers had two of the ACC’s best players in Michael Young and Jamel Artis at a place that rarely had to worry about being left out of the NCAA Tournament. Forward Ryan Luther and guard Jonathan Milligan are the only two scholarship players returning from a group that underachieved last winter, when the Panthers went 16-17 and missed the postseason entirely for the first time since 2000. Artis and Young headed for the pros. Cameron Johnson split for North Carolina as a graduate transfer following a protracted public relations spat with the Pitt administration and just about everyone else headed elsewhere either on their own volition or after being informed they weren’t going to be part of the team’s plans going forward. The group that will take the floor when the Panthers open the season against Navy on Nov. 10 might as well be wearing ”Hi, my name is” tags. Just don’t plan on Stallings or his players to use the lack of familiarity as an excuse. If Pitt wants to be competitive in arguably the toughest league in college hoops, the Panthers don’t really have a choice. The other thing they don’t have? Expectations. Pitt was picked to finish last in the ACC, meaning any upward movement over the next five months will be considered a success. LUTHER THE LEADER: The Panthers must find a way to replace 92 percent of their scoring from last season, when they leaned on Young and Artis to do the heavy lifting. Luther is the leading returning scorer, just don’t expect his 5.7 average from an injury-marred junior year to spike. Instead, Luther’s biggest contribution may be in getting the new-look roster to buy in to what Stallings is selling. PLAY BIG: The Panthers only have one player on the roster over 6-foot-9, meaning rebounding will have to be very much a team effort. Their best chance to be competitive on the backboard may be 6-5 swingman Jared Wilson-Frame, who averaged 14.8 points per game to go along with 3.8 rebounds, 2.9 assists and 1.0 steals per game for Northwest Florida State, a junior college, last season. ”What we need to be is a team that plays together, that defends like our lives depend on it, and rebounds the ball with as much tenacity and physicality as we can,” Stallings said. 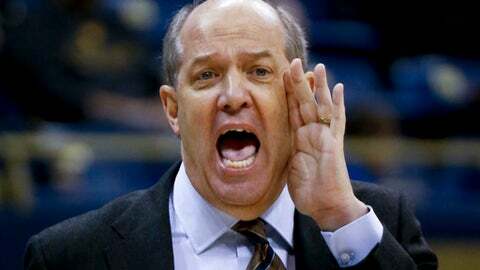 UNFRIENDLY NEIGHBORS: Stallings promised to upgrade the nonconference schedule and while there’s still a ways to go, Pitt will get a chance to see how it measures up to its closest rivals. The Panthers face Penn State in a neutral site game in Brooklyn, New York, on Nov. 20. Pitt also renews ”The Backyard Brawl” with West Virginia when the Mountaineers visit the Petersen Events Center on Dec. 9. REPLENISH THE ZOO: The raucous ”Oakland Zoo” student section became more of a loose menagerie as the Panthers slipped to their worst season in more than two decades. Attendance at The Pete dropped to just 8,327 fans. Down more than 2,500 from 2013-14, Pitt’s first season in the ACC. The novelty of playing the Dukes and North Carolinas of the world has vanished while the losses have ticked upward. While new athletic director Heather Lyke has been supportive of Stallings since being hired last spring, a little early season momentum could go a long way toward providing the Panthers with a boost, however modest.